Gardening can be extremely therapeutic and enjoyable, and in many ways getting a bit dirty is a very good thing. But you don’t want to be trudging dirt into the house on your shoes! After looking at several gardening shoes available for men and women, we’ve found that the best gardening shoes are the Sloggers Men’s and Women’s Waterproof Rain and Garden Shoes. These come in specific men’s and women’s designs for a more comfortable fit, and are a nice mid-priced shoe. They can last for years and are waterproof, non-slip, and made of durable materials. If possible, this shoe is definitely recommended to all individuals who need to work in the garden or be on their feet throughout the day. For more information on the Sloggers, see our Product Reviews section below. The runner-up gardening shoes are the Muck Boots Daily Garden Shoe. Muck Boots produces some of the most durable shoes currently on the market, and their daily gardening models are no exception. These shoes are durable, waterproof, and comfortable to wear. The main reason they come in second is that the Sloggers are slightly more fitted and comfortable. But for the money, Muck Boots are a great deal. For further details on the Muck Boots, see below. For those on a budget, the Amoji gardening clogs are an excellent choice for those on a budget who want to prioritize ventilation. These shoes have holes all over them, and can double as water-shoes, but water and dirt will be able to get in and cover the feet. They are inexpensive, and are well-made, but you may not want to wade into the mud with them. They also don’t cost very much, making them great for individuals who would like something they can wear without guilt. Find out more about the Backdoorshoes in the Product Reviews section. Here are a few important aspects of gardening clogs to keep in mind when shopping. There’s a natural tension in gardening shoes between good ventilation and good water protection of the feet. The more ventilation is present, the more easily water and mud can get into the shoe and onto your feet. If the shoe is completely waterproof, it’s hard for any sweat on the feet to escape, which is uncomfortable as well. Depending on your needs and desires, you may want a shoe that provides more or less water protection and is more or less breathable. Bu these qualities are generally a trade-off. Gardening shoes can get pretty nasty pretty quickly. You want to make sure that the shoe you choose is fairly easy to clean. For the most part, the outer shell of the shoe can be hosed off, and any mud or much you get on there can be removed. But the inner soles can’t always be cleaned easily and may need to be regularly replaced. Shoes with easily-cleaned insoles (especially machine-washable ones!) are a plus. Support is always important when dealing with any shoe! But when gardening, it’s probably more likely you’ll be doing more aggressive work than you might in other times. Lugging plants around, moving pots, garden tools, etc. can all be hard work! Ensuring that your gardening shoes provide adequate support is important. Having a multi-use design is helpful, though not critical, to a good gardening shoe. It’s nice to be able to use your gardening shoe as a rain clog, or to use the gardening shoe as a water shoe. But really, the most important aspect of the garden shoe is how well it performs in the garden! Gardening is one of the most wonderful pastimes humans can do. It’s enlightening, challenging, and rewarding in a deep sense. But can also be quite messy, and taxing on the body. The best gardeners are ones who get down in the dirt and muck and are willing to spend hours weeding, pruning, chopping, trimming, fertilizing, and doing everything they can to make a beautiful display. Much of this work can leave people dirty, sore, and tired, but there are ways to improve the situation. The most important is investing in a good, sturdy pair of gardening shoes that offer support, keep out water and debris, and provide comfort. Here we will look at six different options for gardening shoes. We’ll start with a comparison table to get the lay of the land, and then move into individual reviews before concluding with our favorites. Each Shoe Weighs 6 oz. The Sloggers Men’s and Women’s Waterproof Rain and Garden Shoe (Sloggers) are actually two separate lines from the same brand designed to be used in gardens and on farms. These shoes are made from 100% recyclable material and are medical-grade. The materials used are environmentally friendly, which is always nice. The interior features a special comfort insole designed to cushion the entire foot without creating too much bulk. The exterior is waterproof and comes in a variety of patterns and colors for women such as floral prints, cows, chickens in a barnyard, and solid bright colors. The men’s shoes only come in brown or black. 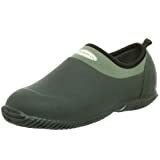 The Sloggers gardening shoes are slip-ons with no exterior holes beyond an opening for the foot. Each shoe weighs roughly 6 oz., making them a lightweight option. A sturdy rubber sole prevents slipping and sliding, and also prevents water from seeping inside. The shoes are available in women’s sizes 6-11 and men’s sizes 7-12. The Sloggers gardening shoes are the best gardening shoes for women and men because they are sturdy, affordable, lightweight, and efficient. They are waterproof and come in a variety of colors, and they also make a separate men’s and women’s line to suit the different needs of varying foot sizes — in our opinion a better strategy than a unisex shoe. The Sloggers are also environmentally friendly and should last for years, making them the best fit for the average person no matter their budgets. The JOINFREE Gardening Shoes for Men and Women are a unisex clog-style shoe designed specifically to be waterproof and can double as rain boots. They work great for slogging through mud and undesirable conditions and feature thick rubber soles to prevent slipping, sliding, and the gradual disintegration of the material. The upper portion is made of vulcanized rubber and features thick nylon around the cuff where the foot is supposed to slide into the shoe. The interiors of the JOINFREE gardening shoes include some mild arch support and padding for increased comfort. The inside is relatively waterproof as well but focuses more on comfort, so the foot should not be slipping or sweating inside. The JOINFREE shoes are unisex, which is great for simplicity, but may ultimately mean that the fit is not ideal for either men or women. They are available in multiple colors in a tri-stripe pattern and come in women’s sizes 5.5-15 and men’s sizes 7-13. 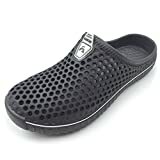 The shoes are slip-ons and are easy to pull on and off. These shoes are great once individuals can find the right size, but they run incredibly small. Sizing can be so bad that some people have had to order at least 2-3 sizes up and still received a product that was tight and uncomfortable. The nylon around the cuff can also cause irritation and chafe, which is why the JOINFREE gardening and rain shoes did not make the top of this list. Vulcanized natural rubber upper : The purpose is to improve the waterproof and thermal insulation of shoes. Your feet will stay clean and dry in the rain, the snow, and even while walking through puddles and mud. Antiskid design of sole: The soles are designed with a combination of stripes and natural rubber, which increases the grip and slip on the shoes. So it can be widely used in outdoor activities such as climbing, garden. And the special weather such as rain and snow. Lightly padded cuff : it is made by a waterproof nylon. It makes shoes easier to wear and more comfortable to walk. User-friendly design: They fit comfortably without rubbing or chafing, and they support your arches and ankles perfectly as you walk. You can also slip in and out of them easily, with a handy pull tab. Rubber sole: These boots are made from high quality natural rubber that won't crack when it stretches. The advantage is that the sole is softer and comfortable. It is suitable for long time outdoor working. Each shoe weighs around 7 oz. The Amoji Unisex Garden Clogs work for both men and women and look sort of like roomy Native shoes. They are available in numerous colors and designed to be lightweight, breathable, and well-ventilated but clearly don’t provide complete water protection to the feet! While the bottom is made of waterproof synthetic materials, the top features many holes to allow air inside and to eliminate any dirt or debris that might work its way into the shoe. Of course, this will mean that your foot will get all muddy if you step in the wrong spot. The Amoji clogs can be slipped on and should sit low around the ankle. The bottom of these garden shoes is made from non-slip materials and designed to have a thicker heel. The material is easy to clean – all the owner needs to do is wipe it down with a damp cloth. The interior is roomy and large enough for people with wide feet. The sizes available include women’s 7-15 and men’s 6-13. These shoes can double as water shoes and offer adequate toe protection. In general, the Amoji Unisex Garden Clogs is a decent shoe that is lightweight and won’t make feet sweat too much. 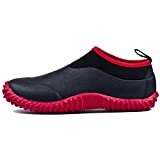 The shoes run wide and the material might be too flimsy for heavy use, but are inexpensive and can work in numerous environments, including as water shoes or at the beach. They’re not made for work in the mud or in heavy dirt conditions, but are great for casual gardening on a warm sunny day! For people on a budget who tend to limit their footwear, these are a great multi-use option if the Sloggers and Muck Boots are not affordable. There are seven colors you can choose.Cute and stylish style. Suitable for outdoor activities or house activities,beach visit,shower,pool,gym,the dirty hotel floor or just go walk with dog. The TENGTA Unisex Waterproof Garden Shoes use a combination of rubber and neoprene to create a sleek, waterproof gardening shoe. This footwear is easy to clean, flexible, and includes an airmesh lining for improved breathability. The bottoms of the TENGTA garden shoes are made of slip-resistant rubber that is thick and contoured to prevent slips and sliding. The area around the ankle is made of the softer neoprene and should not chafe. These shoes can be easily slipped on. The TENGTA garden shoes are flexible and come in four different colors. They are genuinely unisex and available in women’s sizes 5.5-15 and men’s sizes 4.5-13. The shoes tend to be large, so people should order at least half a size down. They are designed to be high traction and to work in a variety of environments, including the mud and uneven terrain. In general, these shoes aren’t the highest quality and do not last as long as they should. If worn every day, some find that they break down in less than six months. The fit is also quite large, which can make it annoying to find the right size. Considering how expensive a single pair is, the TENGTA gardening shoes do not seem worth the money when compared to more durable options like the Sloggers and Muck Boots. 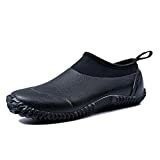 The Backdoorshoes Waterproof Premium Garden Clogs with Arch Support (Backdoorshoes Garden Clogs) are another high quality gardening shoe designed to be waterproof and light on the feet. They are made from a synthetic EVA foam that is soft and contours to the foot for an even fit. The material is environmentally friendly and fully waterproof. Each pair of shoes comes with a 1-year no split guarantee, so if the material breaks, buyers can send them back and receive a new pair. They are available in both men’s and women’s versions and are not unisex. The women’s versions have many more color and styling options. The manufacturer listings for these shoes claim they weigh less than three bananas, or roughly 6 oz. each. The Backdoorshoes Garden Clogs have a slip-resistant bottom with a special rubber tread to avoid accidents. The interior of the shoes comes with complete arch support and a removable and machine-washable insole. These gardening clogs are available in multiple patterns and colors, including floral options. The Backdoorshoes Garden Clogs have some good points but also some downsides. In particular, they come in numerous patterns and have a no split guaranteed, but they seem to go more for fashion than actual heavy duty work. They are on the expensive side, though they don’t last super long. As this roundup is focused on gardening as opposed to general fashion, these don’t match up to the Sloggers or Muck Boots. The Muck Boots Daily Garden Shoe is a lightweight, versatile option that comes in either green or brown. The shoes are constructed from a combination of rubber and nylon which is waterproof and easy to clean. The main body of the shoe and the soles are natural rubber while the area around the ankle is the softer nylon to prevent irritation and chafing. The soles are designed to be slip resistant. These shoes come in women’s sizes 6-12 and men’s sizes 5-13. Unlike a lot of other gardening shoes, the Muck Boots Daily Garden Shoe is fully unisex. They are durable and can withstand all types of weather. The footwear can be worn with or without socks and are designed to slip on and off without a problem. These shoes will last for years. Even though some lines might appear where the toes need to bend, a single pair of the Muck Boots Daily Garden Shoe will withstand up to 2-4 years of constant use without wearing too thin or becoming unsightly. Their unisex nature and balance between water resistance and breathability are a great combination, and the build quality is great. The point is a little high, and quality is on par with the Sloggers shoes, which is why we’ve placed them as our runner-up. When it comes to gardening shoes, it’s important to balance quality with price and functionality. The master of these three characteristics is definitely the Sloggers gardening shoe, with a close second going to Muck Boots. However, considering shoes can be expensive, it’s always important to have a budget option. For those who don’t need a fully water resistant gardening shoe, the Amoji gardening shoes are a great choice. So, slip on some waterproof shoes, prepare the soil, and get planting!